Reports like this using the "broken windows" theory ran rampant in New York City at the height of the graffiti "epidemic" in the 80's. Two books, one by Miriam Greenberg called the Branding New York, How a City in Crisis was sold to the world, and Jeff Ferrell's Crimes of style, help to put this idea into perspective. Urban scrawl, one of the factors this research points to which can cause civil disobedience, is a symptom of the criminalization of visual street interactions carried out by public residents. In Crimes of Style Ferrell points out that once graffiti had been criminalized by the city, artists had far less time to do their work and as a result the large beautiful murals you often saw adorning the subway cars turned into the quick throwups and tagging. The use of the term to graffiti to define tagging is offensive to some on the basis that the true art is much more complex and has its roots in community mural painting more than it does in vandalism. To point out that scrawl is a cause of more civil disobedience overlooks the fact that those lawless areas are often a result of our city "protecting" us against the very scrawl that supposedly creates this lawlessness. If we open our city to public interaction on all levels, much of the blight will be taken care of by those individuals who are credited with causing that blight in the first place. 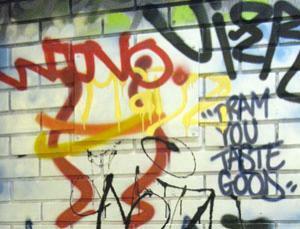 People become more disobedient in environments plagued by litter and graffiti, research has shown. They can be tempted to trespass, drop litter, and even steal money if they perceive from their environment that it's OK to break rules - such as when "no litter" signs are flagrantly ignored. "[It's better to have] no rule than one that no-one complies with," says Kees Keizer, head of the team at the University of Groningen in the Netherlands which conducted the latest experiments. The research is the first to confirm experimentally that disorder and disobedience grow in neighbourhoods where rules are openly flouted, a phenomenon dubbed "broken window" theory. "Broken window theory says that if there are broken windows in houses, it will lead to more disorder and a degrading neighbourhood," says Keizer. Keizer says that despite the theory dating from 1982, no-one had conclusively proved it's true, so he and colleagues Siegwart Lindenberg and Linda Steg set up six practical experiments to put it to the test. In each of the experiments, the researchers set up real-life situations in Groningen in which random citizens would be tempted to do something unruly, illegal, or antisocial. Then, they discreetly watched what happened, without the passers-by realising they were under observation. With no litter or graffiti, 13% of the passers-by stole the money. Thefts doubled to 27% when the mailbox was daubed with graffiti, or to 25% when it was surrounded by litter. "It's quite shocking that the mere presence of litter doubled the number of people stealing," says Keizer. In another experiment, motorists returning to collect their cars were three times more likely to trespass through an illegal, 200-metre short-cut to the car park if bicycles had been illegally locked to railings next to the forbidden entrance. A massive 87% took the short cut when they saw the illegally parked bicycles, despite a police sign saying "No Trespassing". This compared with 27% trespassing when the bicycles were not locked to the fence. Another experiment in a cycle park bearing a clear anti-graffiti sign, revealed that cyclists were twice as likely to leave litter if the researchers had daubed graffiti on the walls. The team attached bogus flyers to the bikes' handlebars to put the owners in a situation where they had to decide whether or not to litter. The researchers conclude that one type of antisocial behaviour leads to others, because people's sense of social obligation to others is eroded. "When people think they can get away with it because other people already have, they do," says Keizer. The other major conclusion is that signs probably make things worse if it's clear that people are ignoring them. The trick, says Keizer, is to persuade citizens that other people in their own community will suffer if they fail to observe norms of responsible behaviour. "You're calling on people's obligations to others rather than saying: 'Don't do this'," he says. A good example, says Keizer, is a smoking ban introduced during the summer in Dutch restaurants. There was huge opposition to it, he says, because the government failed to explain the objective of the ban in terms of protecting other people from the damaging effects of passive smoking. In places like Ireland and Scotland, by contrast, the bans were accepted because the potential for harming others was made much more explicit. Keizer says that the research is the first to explain and demonstrate experimentally the "broken windows theory", but he adds that it would be a mistake to see it as vindication of "zero-tolerance" policies, like those deployed to clean up New York in the mid-1990s. Zero-tolerance policies can be counterproductive, he says, because people simply see them as declaration of war and carry on offending. Geraldine Pettersson, a consultant in London who co-authored a 2003 report on graffiti for the UK Department of Transport agreed. "You make it sound like a battle, and it becomes a challenge to them," she says. Pettersson says that the results do indeed support the broken window theory. "People associate the presence of graffiti with a lack of social control and management of their neighbourhood or environment, and it relays the message that no-one is 'in charge'," she says.